Activates 2-finger scrolling on pre-2005 PowerBooks. Is there a better alternative to iScroll2? 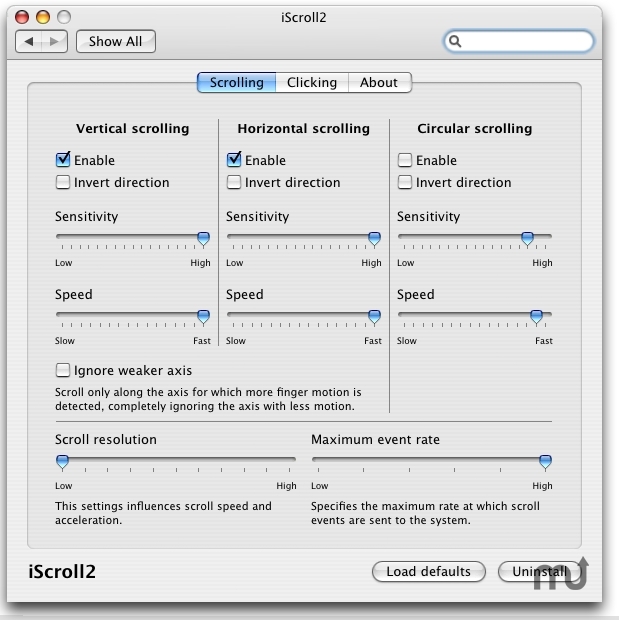 Is iScroll2 really the best app in System category? Will iScroll2 work good on macOS 10.13.4? iScroll2 is a modified trackpad driver that adds two-finger scrolling capabilities to supported pre-2005 PowerBooks and iBooks on OS X 10.3 and up (version 0.29 and later require 10.4). Supported models include most aluminum PowerBooks introduced from 2003 to 2004 as well as all G4 iBooks. Note: Models that have two-finger scrolling already built-in are not supported! These use a completely different, USB-based trackpad, the driver of which is not available as open source. Fixed a typo in main() that caused the settings daemon to crash on load. Please do not use version 0.31! Note: This version requires Mac OS X 10.4 or higher! 2003-2004 model Aluminum PowerBook or any G4 iBook. See website for details. iScroll2 needs a rating. Be the first to rate this app and get the discussion started! iScroll2 is based on Apple's AppleADBMouse-209.0.10 driver for the ADB-based trackpads found on older models, which is available as part of the publicly released Darwin source code (and covered by the APSL). The code added for supporting two-finger scrolling was written from scratch.